September 16, 2015 – In an election campaign dominated by economic issues, which party’s fiscal promises resonate most with Canadians? Which are falling flat? And to what extent do individuals see themselves benefitting from fiscal political goodies being proffered by the leaders? Those were the questions posed in the latest Angus Reid Institute public opinion poll of eligible Canadian voters canvassing support for – or opposition to – some of the more high-profile “pocket-book” commitments made by the main parties in order to woo voters. While the list presented to survey respondents is preliminary and not exhaustive – the survey shows certain party pledges enjoy vastly more support than others. Part 1 – Do any of these Promises really make a difference to the Economy? The economic “bad news, good news” nature of this campaign has allowed the parties to tailor campaign messaging to their strengths, evidenced by this week’s news of a $2 billion dollar surplus (a perceived boon to the CPC campaign) or indeed earlier news from Statistics Canada that the country was in an official, technical recession (a chance for the opposition parties to pummel the incumbent and highlight their own platforms). Perhaps unsurprisingly, sentiment falls out along political lines – with Conservatives much more likely to say the state of the economy is largely out of the hands of government. That said, majorities of all main party supporters (CPC included) think otherwise – giving government credit for being able to have at least minor impact on the economy (87% – NDP, 86% – LPC, 79% CPC). Given that the vast majority of Canadians see an ability for government to pull levers on economic performance, the promises of parties – and reaction to them – take on heightened importance. To gauge opinion on party promises, the Angus Reid Institute presented survey respondents with pairs of opposing economic policies and asked them to choose which one they preferred, without reference to the party putting the pledge forward. Indeed, Justin Trudeau and the Liberal Party have pledged to run “modest deficits” for their first three years in government, with the goal of stimulating the economy through additional spending. The party has stuck with its plan despite the current Conservative government posting a surplus in the last fiscal year. Philosophically, the majority of Canadians – and indeed even a small majority of Conservative supporters – agree with the Liberal approach. Notably, this support is stronger among so-called “soft” or uncommitted Conservative voters – those who say they’re planning to vote for the CPC, but admit they could change their minds over the next four weeks. 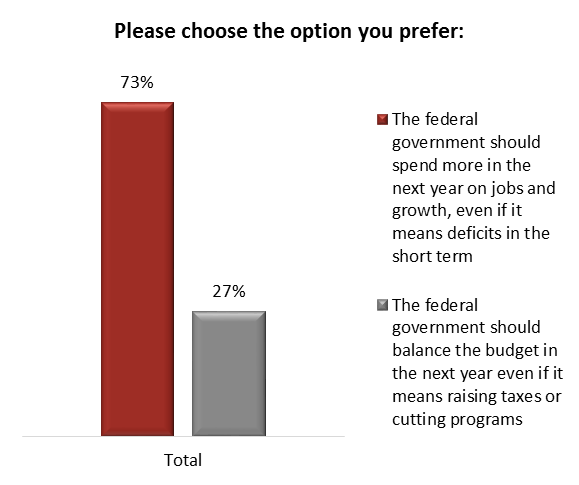 Nearly two-thirds of these “Soft” CPC voters (63%) choose government spending – even if it means deficits – over raising taxes or cutting programs to balance the budget. Reducing the small business tax rate to nine per cent has strongest support in Ontario (70%) and the Atlantic provinces (76%). Support is weakest in Alberta, where we see a 51-49 per cent split. Overall, a small business tax reduction is a winner across all parties, though NDP supporters are somewhat less on board (65% CPC/66% LPC/57% NDP respectively). Niche tax cuts are most popular in Alberta (59% support); least popular in Quebec (41%) and Manitoba (42%). Support also varies significantly by age group, with younger groups more likely to be onside. This measure is slightly more popular among women (66%) than men (59%), and – predictably – very popular among the middle income bracket (71% support among those earning $50k – $99k). It’s a proposal that enjoys uniform support across party lines (CPC 61%; LPC 66%; NDP 61%) and little wonder: 47% of voters see themselves as middle class. As noted above support for increasing the corporate tax rate to 2006 levels is intensely political (CPC 38%; LPC 72%; NDP 75%). That said, soft CPC voters are more split. Half (50%) favour an increase in corporate taxes, while half say to leave them where they are now. Politics plays a strong hand here too: although majorities across all parties support this measure, it is highest among non-CPC voters: (CPC 57%; LPC 81%; NDP 81%). Also, soft CPC are especially more favourable than committed voters: (68% support versus 51%). Here we see support for a $10,000 annual TFSA limit regardless of vote intention, but this measure is especially popular among Canadians supporting the CPC (CPC 78%; LPC 62%; NDP 63%). Increasing the age for OAS eligibility was clearly not a pretty prospect in the eyes of Canadians when first introduced by Stephen Harper. Leaders of the opposition parties have pledged to roll it back to 65. That said, people with university educations and those making more than $100,000 per year are more likely to say agree with eligibility at 67 (28% of each group). The NDP vows to re-introduce a minimum wage for those working in federally-regulated industries. On this, Canadians are split, along income lines, and depending on the minimum wage set by their own provincial governments. The NDP is proposing to raise its foreign aid contributions from 0.24 per cent of Gross National Income, to 0.7 per cent, or about $15 billion a year. This is a non-starter with most Canadians, as evidenced by the three-quarters who think the contributions should stay as they are. That said, the move is more popular among younger people, and those with university educations. The Angus Reid Institute also asked Canadians to choose their preferred proposal on the issue of child care. This question was not a direct face-off, because each of the three main parties has put forward a different approach. As well, fewer than one-third of Canadians (30%) say a campaign promise or platform would be a direct benefit to them.